Except the meat we buy from the butcher’s we basically only buy meat from the super market when it is on sale due to short expiration date or something similar. The other day I managed to pick up a pair of sirloin steaks with short expiration date for a now reasonable price (-77 % of the original price…). So, we ended up having that for dinner. 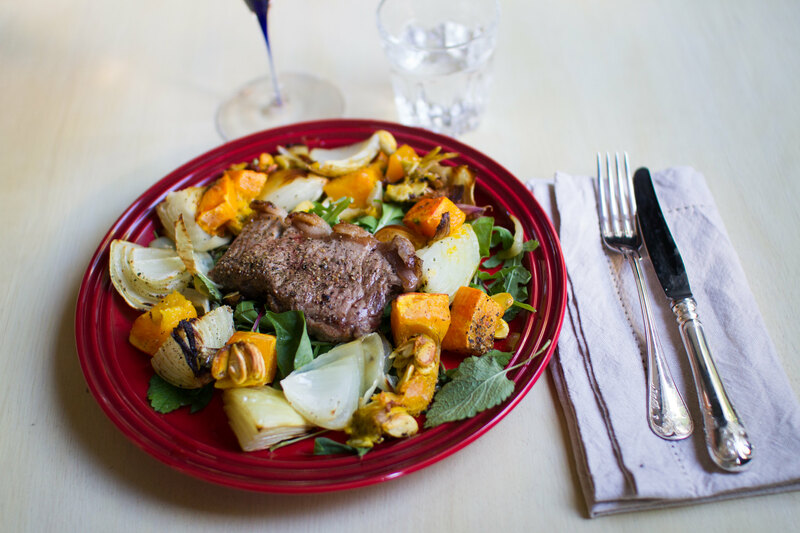 In general we should say that we definitely prefer the less fancy pieces of meat primarily because of the higher fat content and all the flavours that contains. We would much rather buy a nice oxtail than a t-bone steak, not to mention the huge price difference between the two. 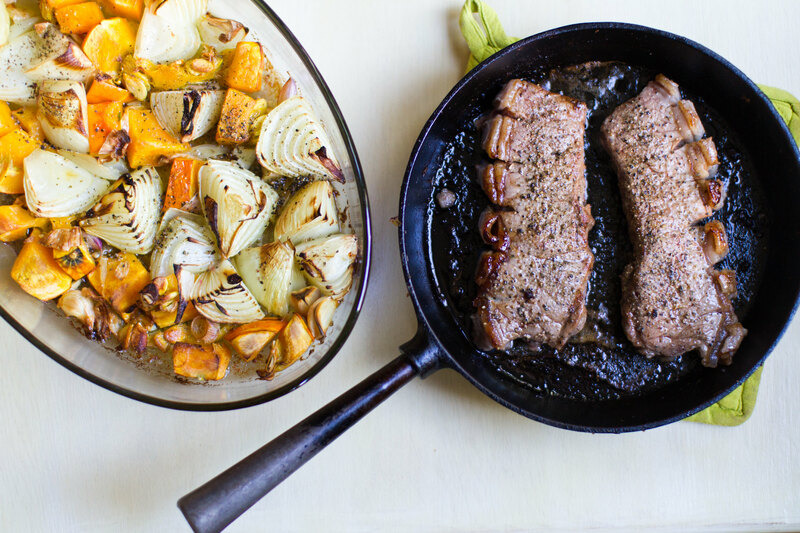 The sirloin steaks fried in the cast iron pan and the oven roasted vegetables. To accompany the steaks we roasted some hokkaido pumpkin, some brown onion and fresh garlic. Simple and tasty. It is so nice that the season for pumpkins and squashes is starting again. We really look forward to having some butternut squash as well as a lot more Hokkaido pumpkin. Dinner is served. 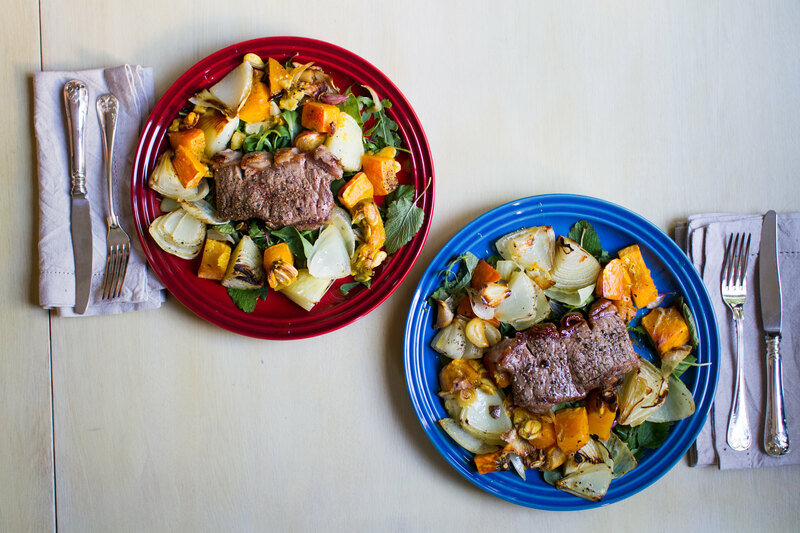 The sirloin steak with oven roasted vegetables and a green salad. The dinner turned out really well and despite our reservations the sirloin steak was indeed tasty.